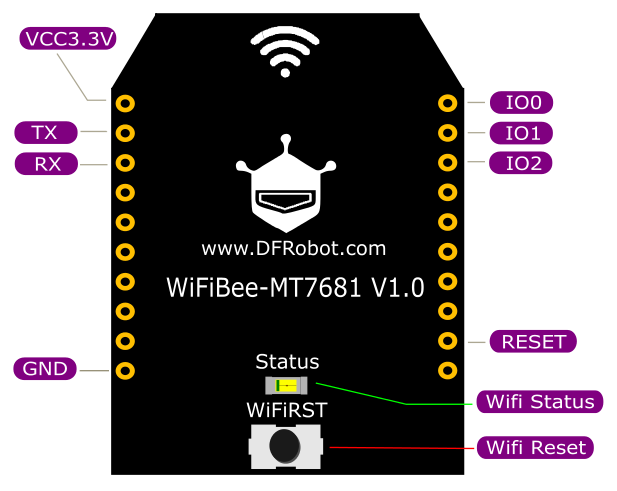 The WiFi Bee MT7681 is an Arduino WiFi XBee module based on the MT7681 serial Wi-Fi module. It is compatible with an XBee slot, supports Arduino wireless programming and is ideal for Internet of Things (IoT), home automation and robotics applications. The WiFi Bee supports the IEEE802.11b/g/n standard protocols, with 2.4G Wi-Fi bands, 14 channels and WEP/WPA-PSK/WPA2-PSK/TKIP/AES encryption methods, compatible with many mainstream routers. It has STA and AP working modes, is free to switch, and supports TCP/IP communications. In addition the WiFi Bee also supports Smart Link intelligent connection. The unit is easy to use - just install the app (Android), and connect to your wireless router. The WiFi Bee has same pin mappings as an XBee. It can be inserted in any device which has an existing XBee socket for full networking capability. For Arduino UNO and Arduino Mega 2560 boards, the WiFi Bee can also be used as a wireless code upload module eliminating the need for a USB cable or physical connection. This is very convenient when debugging robots or mobile platforms. In addition the module breakouts include three I/O ports. Use it as a Wi-Fi remote control - each I/O supports software PWM outputs. You can configure the parameters using serial AT commands via the serial terminal. 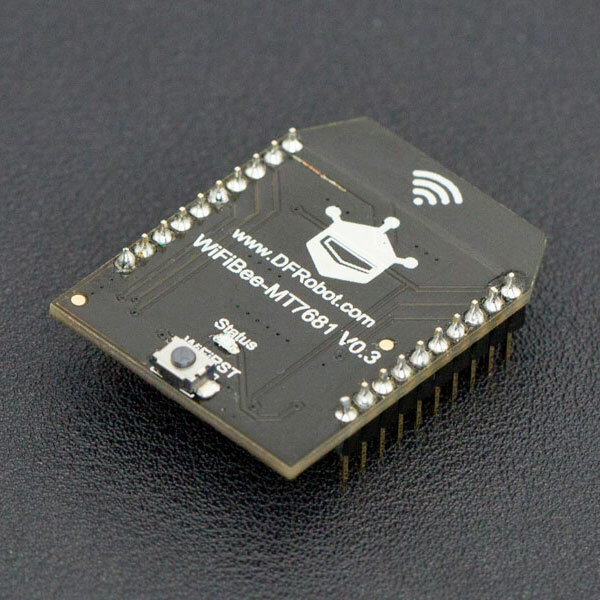 There are also other wifi bee such as ESP32 and ESP8266 wifi bee for you to choose. Wait for some seconds, when the LED flashes slowly (2/s), it means it has been connected to the WiFi. You can see the device IP address in the APP. 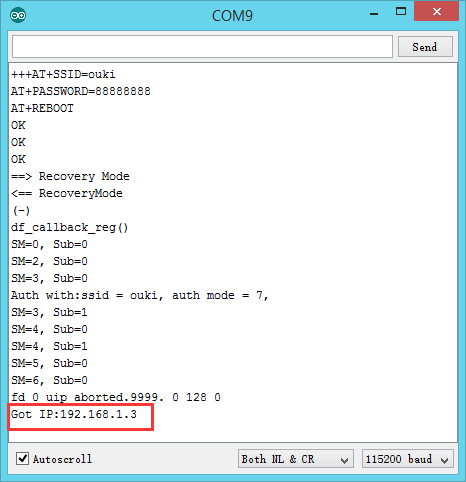 Turn the shield switch to "‘’‘PROG’‘’"
AT Command is generally applied to the terminal equipment and PC communication, In this section, we use AT command to configure network parameters. WiFi Bee supports TCP & UDP service, in this section, we'll demonstrates the TCP <-->UART communication. WiFIBee supports WiFi Wireless Programming function, just connect WiFi bee to network which you PC in. For now, it supports Arduino UNO, Mega2560, DFRduino M0. 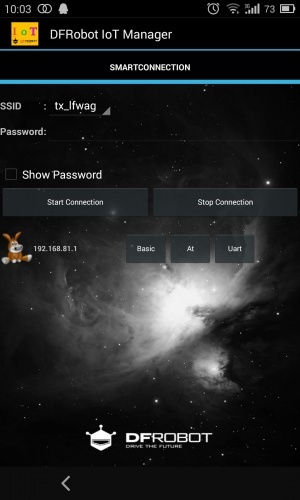 Open the tool, the software will search the device in the network automatically. select "Use Default File" cache files. it will be the last compiled HEX file. And you can load the HEX manually, "Manual Assign File". 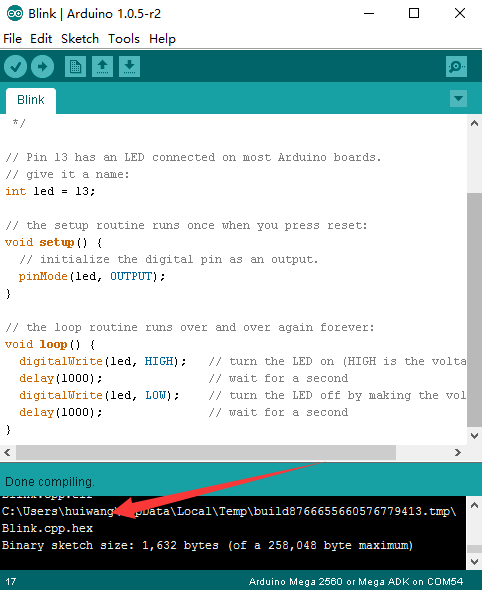 Open arduino IDE, open a sample code, such as "Blink". Select the board, UNO or Mega2560, click Update. Watch the board D13 indicator LED, it should be Blinking now. AT+SOFTAPCONF=jansion1,a12345678 Set AP SSID and Password “jansion1” “a12345678”. AP mode also support APP control and Wireless Programming, just work as STA mode. The users can update the firmware by themselves. image:mt7681_update_tool_open.png|1. 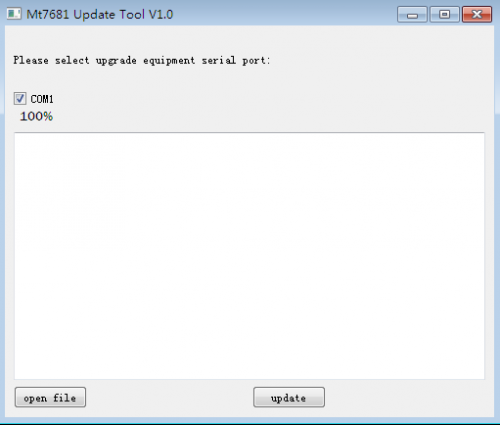 Open MT7681 Update Tool image:mt7681_update_tool_select_file.png|2. Select the newest firmware image:mt7681_update_tool_uploading.png|3. Select COM port and click "Update"
Q1 The Led looks dim, and no flashing, why? A Please press WiFi Reset Button, generally it is a power issue. The power consumption of WiFi bee is a little large. Q2 I can't upload any sketch via WiFi, why? A If the module is in the local area network, you can send AT command to Port 1001 to control the GPIOs; If you want to make a remote control via Internet, you can try router port mapping. For now it doesn't support initiative remote server connection. Q4 How to use SmartLink? A The module will enter smartlink mode, once it can't access any WiFI network. Shopping from WiFiBee-MT7681 or DFRobot Distributor.